If you’re like me and have attended an improv show, you sat in awe of the talented actors on stage. Their ability to perform without a script amazes me. “I could never do that,” I would say to myself. Imagine my surprise when I saw a session on improv on the agenda for this year’s Content Marketing World. Kathy Klotz-Guest, improv comedian and author of “Stop Boring Me!”, will share with attendees how organizations can apply improv to solve content marketing challenges. 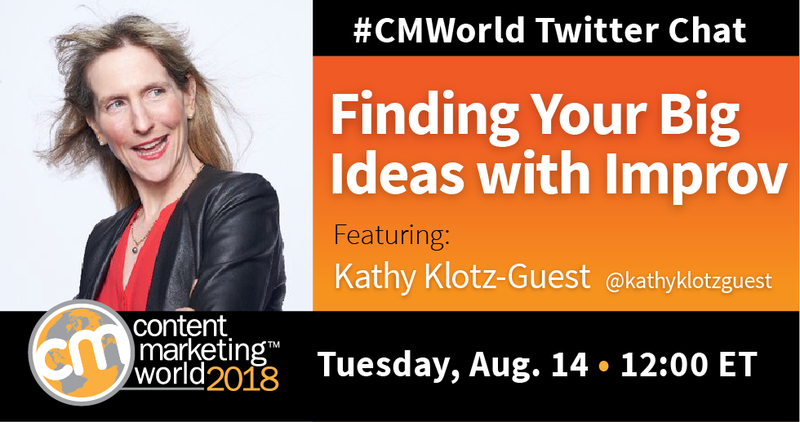 We wanted a sneak peek of her session, so we asked Kathy to join us on a recent #CMWorld Twitter chat. What follows is a brief look at our conversation. It’s clear that we marketers can learn a thing or two from improvisational thinkers. Improv often connotes “Open Mic Night” in comedy clubs. How can we shift that mentality to the business world? What improv techniques can we borrow to help inform our content marketing? Want more? I know I do. Check out our Twitter Moment for a complete look at questions and answers from the chat. And don’t miss Kathy’s session, Yes And! Turn Your Culture (OR CONTENT TEAM) into a Fresh-Idea Startup, on Thursday, September 6. Did we mention The Second City is a Content Marketing World sponsor? And did you know CMWorld headliner Tina Fey is a Second City improv alum? 2018 is definitely the year to attend. Register now with code SM100 for a $100 discount!